Feed the Enemy: Flanger settings for John McGeoch doing Permafrost. Flanger settings for John McGeoch doing Permafrost. 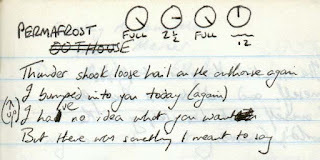 Hand written Permafrost lyrics and Settings (Manual, Depth, Speed and Regen for John McGeoch's MXR M-117 flanger as featured at the Official Magazine Facebook Site HERE.